Found 19 file extension associations related to DAEMON Tools for Mac and 3 file formats developed specifically for use with DAEMON Tools for Mac. 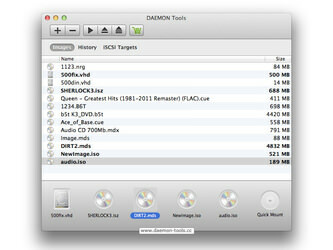 First DAEMON Tools solution for mounting CD/DVD/HDD disc images on Mac. Mount images in the following supported formats: *.b5t, *.b6t, *.bwt, *.ccd, *.cdi, *.bin/*.cue, *.ape/*.cue, *.flac/*.cue, *.iso, *.isz, *.mds/*.mdf, *.mdx, *.nrg, *.pdi, *.dmg, *.vhd. Mounted device quantity is not restricted any longer. If you need more information please contact the developers of DAEMON Tools for Mac (DT Soft Ltd), or check out their product website.